New Zealand Police is the lead agency responsible for reducing crime and enhancing community safety. New Zealand Police works with the community to make New Zealanders be safe and feel safe. With over 12,000 staff, they provide policing services 24 hours a day, 7 days a week. Police operate by land, sea and air, manage over 860,000 emergency calls a year and are always actively preventing crime and crashes. 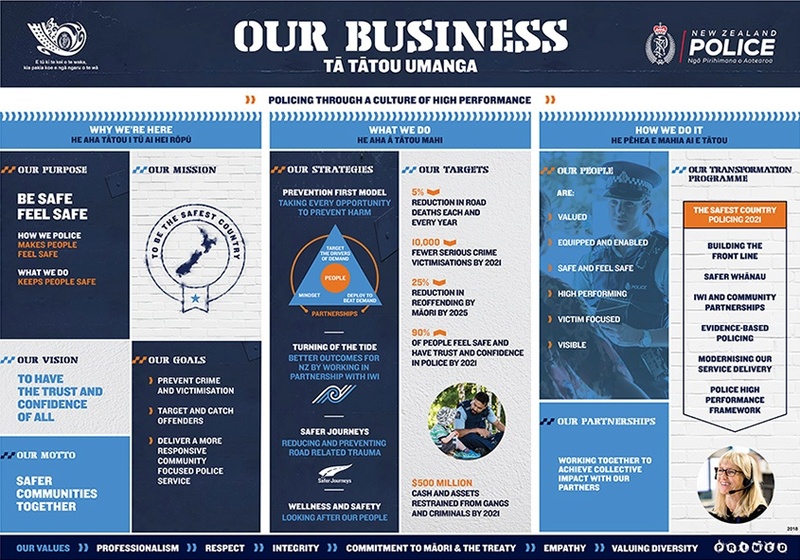 New Zealand Police work towards specific goals and targets that highlight their intent to work collaboratively with iwi and communities, other government sectors and business partners to deliver ‘Our Business’ and achieve long-term change. The New Zealand Police co-ordinate search and rescue activities in New Zealand for Category 1 searches, which are searches coordinated at the local level. They usually involve local resources and people who are familiar with the area. Land Search and Rescue, Surf Life Saving, Amateur Radio Emergency Corps and other similar organisations. Coastguard, LandSAR, rescue helicopters, Defence Forces, and other volunteers.